There are approximately 180 members, of whom about 110, with their children, are living in the twelve village areas. Bundagen is independent of mains water, sewerage and electricity. We rely on dams and rain-water tanks and use alternative technology, such as solar power and composting toilets. All residents pay a weekly levy which finances the community’s needs including shared equipment such as a tractor and fire tanker. 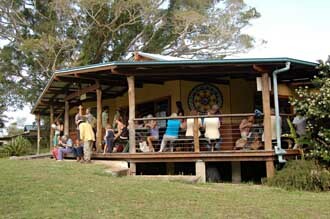 As well, we have a library, food co-op, meditation space and community house where a café is held each week. Villages each have their own areas of interest; some share a common bathroom, gardens, mowers, trailers or water pumps. Apart from meetings and regular working bees, café and the beach, members come together to play volleyball or soccer, for yoga, chi gong or to sing, play music, or to meditate. We have an active weeding group and land care projects underway. There is also a playschool in the renovated dairy bails where our youngest residents get together each week. Older members now meet to plan for ‘The Last Resort’. Decision-making is made on the land. We aim at reaching consensus but have our own form of modified consensus. We have monthly community meetings, which deal with everyday matters, and four general meetings a year to address major concerns. Bundagen newsletters keep members informed of our evolving agreements, topics of debate and all hatches, matches and dispatches. A group of fifteen annually elected co-ordinators, meet monthly and take responsibility for specific areas of administration such as secretarial, treasury, legal liaison, environment, membership, building, fire, water, roads etc. Each member, whether resident or non-resident, has an equal parcel of shares in the Co-operative. Membership gives the individual access to the land and a voice in decision- making. The right to build and reside on the land is decided by community agreement. Our legal structure, as a rural co-operative, means that the community owns all improvements on the land rather than individuals holding freehold title.